On Tuesday, June 2 at 9:30AM, there will be a Congressional Briefing sponsored by the American Friends Service Committee (AFSC) with opening remarks by US Representative Keith Ellison focusing on a little known aspect of the Israeli occupation that illustrates the trauma experienced by Palestinian children, their families and their communities. This briefing comes at a time of increasing pressure on the Israeli government to change their policies toward Palestinian child prisoners – many as young as 12. “The detention of Palestinian minors by Israel raises serious concerns that serve as a call to action for those who feel a responsibility to care for the most weak and vulnerable members of society,” said Rabbi Brant Rosen of the AFSC. The briefing will feature testimony from Tariq Abu Khdeir, the Palestinian American teenager who was arrested and brutally beaten by Israeli police in the summer of 2014. Representative Ellison will give the opening remarks and Rabbi Brant Rosen of the American Friends Service Committee, Joe Stork of Human Rights Watch and Bradley Parker of Defense for Children International Palestine will also be testifying. Every year, more than 700 Palestinian children as young as twelve-years old are taken from their families, brought to an undisclosed location, harshly interrogated and imprisoned by the Israeli military on the suspicion of throwing stones. “Many of these children are arrested in the middle of the night, and then subjected to a harrowing sequence of events, all without their parents knowing where they are or why they’ve been taken,” said Bradley Parker, attorney with Defense for Children International Palestine. The Congressional Briefing is part of what the No Way to Treat a Child Campaign is calling “DC Advocacy Days highlight issue of Palestinian Children in Israeli Military Detention” and also include an Interfaith Vigil on Monday, June 1, at noon on the U.S. Capitol Upper Senate Park and a film premier of the documentary “Detaining Dreams” on Tuesday, June 2, 7:00 pm. Speakers at the Monday vigil include Rev. Graylan S. Hagler, African-American activist, writer and Senior Pastor, Plymouth Congregational UCC, Washington, DC, Dr. Mai Abdul Rahman, Palestinian-American writer, organizer, educator and board member of the Muslim Women’s Association, Wardah Khalid, Scoville Fellow in Middle East policy at the Friends Committee on National Legislation Education Fund (FCNL) and Rabbi Brant Rosen, American rabbi, journalist, author and blogger, Midwest Regional Director of the American Friends Service Committee. The June 2nd film showing is the world premiere of “Detaining Dreams,” a documentary featuring the stories of Palestinian children and their families undergoing the ordeal of Israeli military detention. The film’s producer Amr Kawji will join a discussion with Tariq Abu Khdeir, Suha Abu Khdeir, as well as Joyce and John Cassel, American Friends Service Committee volunteers, and Bradley Parker of Defense for Children International Palestine. When we say end the occupation to our elected officials, it means ending these routine types of attacks on Palestinian society, particularly on those most vulnerable — children. We are asking our government to make assurances that military aid to Israel, over $1 billion dollars a year, does not fund the Israeli military detention of children. Given the reluctance of members of Congress ever to criticize Israeli government policies and practices, we realize we are putting elected officials in a difficult spot — as we are asking them, do you support Palestinian children taken from their families, brought to an undisclosed locations, harshly interrogated and imprisoned by the Israeli military on the suspicion of throwing stones? We hope Congressional members with a conscience will say no publicly, these actions are no way to treat a child. I think audiences are stunned to hear about the detention of children — some as young as 12 years old — and their rough treatment by soldiers on the pretext that a kid was throwing stones. The night raids and impact of detention on children and their families, even after their experiences in prison, really raises a concern about the future health of Palestinian society. Recent reports from lawyers in Palestine on the treatment of Palestinian child prisoners continue to be disturbing. Hiba Masalha, a lawyer for the Palestinian Authority (PA) Committee of Prisoners’ Affairs, said in a statement on Sunday that teenage detainees are being “terrified, threatened and blackmailed” in contravention of international law and conventions advocating children’s rights. She had visited Section 3 of Megeddo prison, where 68 Palestinian teens are currently being held. She also claimed that the teens were being beaten and tortured in a “heinous” way by Israeli soldiers during interrogation. Israel is the only country in the world that automatically prosecutes children in military courts that lack basic and fundamental fair trial guarantees. Since 2000, at least 8,000 Palestinian children have been arrested and prosecuted in an Israeli military detention system notorious for the systematic ill-treatment and torture of Palestinian children. Around 500-700 Palestinian children are arrested, detained and prosecuted in the Israeli military court system each year. The majority of Palestinian child detainees are charged with throwing stones, and three out of four experience physical violence during arrest, transfer or interrogation. No Israeli child comes into contact with the military court system. As of April 2015, Addameer Prisoner Support and Human Rights Association reports that there are 182 children in Israeli prisons and detention centers, including 26 below the age of 16. Timid. More advocacy is needed from the grassroots to pressure officials to do the right thing. But we have generated more than 10,000 letters to Congress in the last week on this issue, so at least they are hearing from some people. After the hearing, the campaign will continue to meet with members of Congress over the summer, hoping to influence some to visit and see for themselves military courts in the West Bank. The hope is to see high level officials raising this issue with the State of Israel so there will be a change in detention patterns of Palestinian youth. Campaign members will also continue to raise awareness in local communities around the US with the video of “Detaining Dreams” and a photo exhibit called “Night Raid” that interested groups can host in their community to further the discussion about Israeli military detention and ill treatment of Palestinian children. 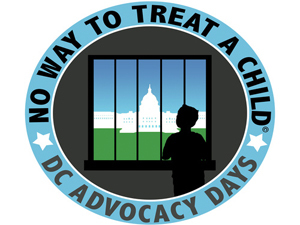 The DC Advocacy Days events are sponsored by the No Way to Treat a Child Campaign, Defense for Children International Palestine, American Friends Service Committee, and the US Campaign to End the Israeli Occupation. Previous articleWhy is the Anti-BDS Lobby Celebrating Their Non-Victory in Illinois? I hope that the men and women in congress who vote to spend our tax dollars to financially support Israel’s military will have the courage to attend this event and recognize the unconscionable use of our funds to illegally brutalize Palestinian children. The damage and trauma caused to children and families last long after the children’s arrest and imprisonment. As a Jew, I and many other Jews do not feel that allowing Israel to violate international law and hurt children is a justifiable use of our money, nor does it support the Israel that our grandparents dreamed of creating. Please do not shrink from the reality of what Israel has become. It does not help Israel to be a democratic partner or a moral country when it is not held responsible for unethical and criminal behavior. I have distributed your email asking our members to request their congrssional members to attend this brifing. I encourage you to video tape this event and make it available to your supporters. The Friends of Sabeel in Los Angeles and Orange Counties are participating in “From Ferguson to Mexico to Palestine” on June 6th and will distribute material from your campign. You guys are a bunch of brainwashed morons. Let’s get this straight. If a kid in Chicago throws a rock at a cop or a cop car, they’re gonna get arrested and probably thrown in Juvi. It’s no different in Israel except the little palestinian animals are encouraged to throw rocks and act violently from the day they’re born. It’s a shame their sick and twisted parents can’t teach them love and peace. If they did there wouldn’t be any more “palestinian child arrests.” Duh.